When Michael Seawright trained as a marine biologist at the start of his career, he could hardly have imagined he would end up leading nutrition projects in South Sudan as a project coordinator for Médecins Sans Frontières (Doctors Without Borders). Although marine biology was his first qualification, Seawright actually began managing projects in the IT sector, from investment banks in London to telecommunication companies in Ireland and across the Pacific. It was his work in this sector that gave him the experience of working with a range of stakeholders in complex contexts that would come in handy later. “The work involved project management implementing IT systems including extensive consultation with business stakeholders. This experience managing complex projects helped me considerably in my work with Médecins Sans Frontières,” he says. Ten years ago, Seawright made a switch and headed to South Sudan to coordinate humanitarian projects with an Irish Aid agency called GOAL. It was there he encountered a hospital run by Médecins Sans Frontières (MSF). “I was very impressed at how well the project was run and in seeing a job advert for project coordinators I applied to work with them,” he recounts. Since then he has worked for other aid agencies but has spent the past eight seeking field work with MSF responding to health emergencies resulting from natural disasters, such as the 2010 Pakistan floods, and working in conflict zones such as Syria. The Pakistan project was one that stands out in his mind. The previous year, Seawright had spent six months in negotiations with Pakistani officials to secure permission for MSF to operate in the region. 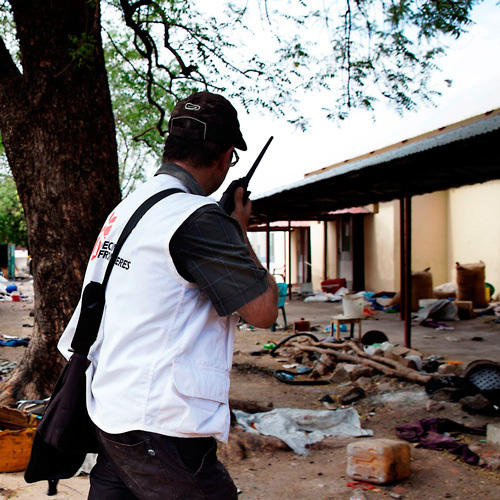 It was this access that allowed MSF to quickly respond to the urgent needs of the population. “Extensive flooding had displaced large numbers of people from their land into camps and onto elevated roads beside their land. They had little or no shelter and none of the necessities needed for daily living,” he explains. Working with MSF’s Dutch team in East Baluchistan, Pakistan, he started with its 60 staff, which soon swelled to 160 as the situation escalated. Seawright’s role was to coordinate MSF’s efforts with the activities of the authorities, no mean feat in the fraught environment. His most recent assignment has been comparatively easy, though no less harrowing: setting up nutrition clinics and cholera treatment centres in South Sudan, his sixth assignment for MSF. “The project for which I was responsible provided medical care in the form of nutrition clinics and cholera treatment centres for communities affected by the civil war which started in late 2013. The conflict has led to large numbers of people who have been displaced which has resulted in camps of people affected by malnutrition and other diseases such as cholera.” MSF treated more than 800 cholera cases over 10 days, saving many lives in the process. So how do you know if you’re cut out for managing humanitarian projects? Seawright says a calm disposition and an ability to handle pressure and difficult living conditions are “an essential requirement”. He also warns that the highly rewarding work does come with a price: time away from friends and family. As such, undertaking field is not to be taken lightly. From a technical perspective, Seawright lists “experience managing staff, finance and budgets, along with project management and negotiating experience” as useful skills. Most importantly, however, you need a desire to help others. “The job can be challenging at times and a strong humanitarian interest is needed to maintain the motivation needed to deal with difficult situations,” he explains. You don’t need to be medically trained to join Médecins Sans Frontières. If you’re interested in applying for a project coordination role, visit www.msf.org.au/join-our-team to find out if you’re eligible.